Today I just got some impromptu thoughts of writing my road trip back in 2011 with my Auntie Fiona & Uncle Jaap (Pronounce as Yap) . It isn’t some impromptu blog actually because this year Ger’z World is working towards being a “travel blog” we are launching our “Gerlyn’s Getaway”! Last summer, I was at a road-trip to Western Australia with my Aunt an Australian, my Uncle from Netherlands and me from Singapore. We booked a camper-van from Britz and off we set off to explore the amazing Western Australia for 8d7n. The most amazing thing I experience in this trip is my visit to Monkey Mia on Day 4. When speaking of Monkey Mia, you would most probably thought that I am visiting the Monkeys. But you’re wrong! We are visiting the Wild Dolphins. As a dolphin lover, I prefer to watch the Wild Dolphins as they are free to roam in the ocean without being trained to perform. Monkey Mia is the best place for Dolphin watching as they have crystal clear waters and daily visitation of dolphins in the morning for dolphin feeds. Below is some tips I have and the route I travelled. Actually I have sent an email to my internship supervisor in 2013 so you guys could actually take a look. I would suggest a hi-top instead of those with shower/toilet facilities. Why? You would not want to wash the toilets during your trip and basically, you can find petrol station to use their washroom. Bathing facilities are also available at campsites. More tips can be found http://www.britz.com.au/australia-travel. http://www.westernaustralia.com/en/Things_to_See_and_Do/Suggested_Itineraries/Pages/Indian_Ocean_Drive.aspx<— This is my itinerary that time. Suggested is 11days however I completed in 8days, because we don’t stop more than 1 night in a location. But maybe you can take things slow and do it in 10days? Hopefully what I have mentioned above did help you in planning but no worries, do drop me an email or leave a comment below if you need anymore advice. I will try my very best to answer all your hot & burning questions! Here are some photos which I have taken during the trip in 9 different locations. Photos taken using an iPod Touch. P/s If I knew i would embark on such a trip, I would have bought a gopro to capture my first snorkelling adventure! But better than nothing. Enjoy the photos~! 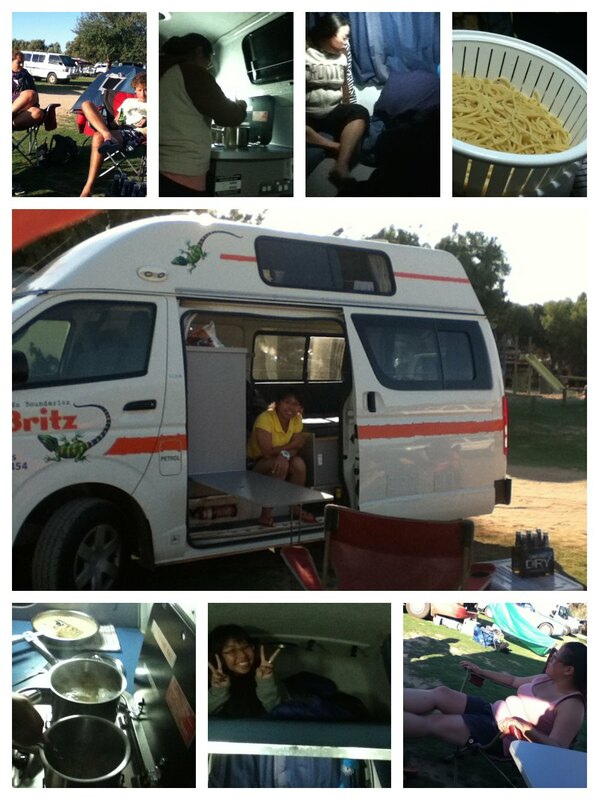 So we actually took the cheapest campervan for 3 sitters. There is a queen size bed below and the top is a super mini single sized bed. Which were meant for kids. I like this van alot because we get to cook because they provide a gas stove for us and also they have microwave oven inside too. 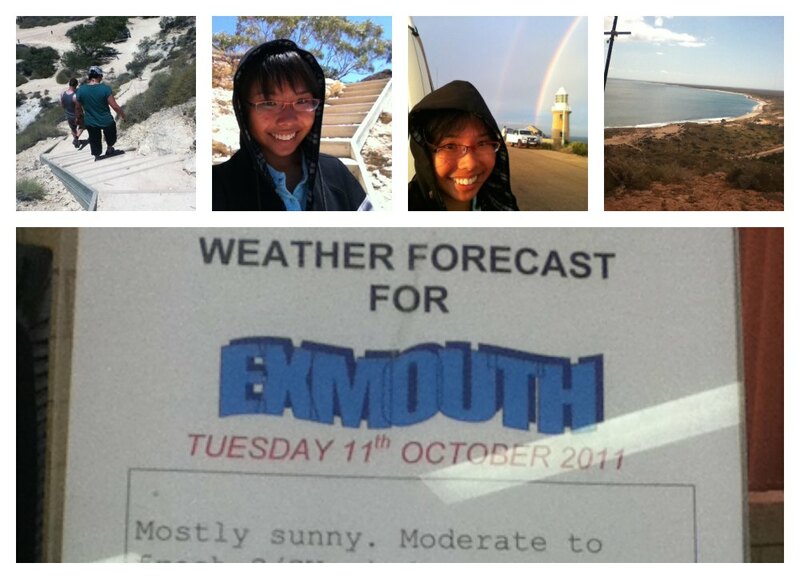 Exmouth is a place meant for whale watching and snorkelling. We spent 2 days there just to snorkel and sun-tan at the beach. Extremely chillax! It would be great if you pair up the sunset watching together with an icy cold soda! 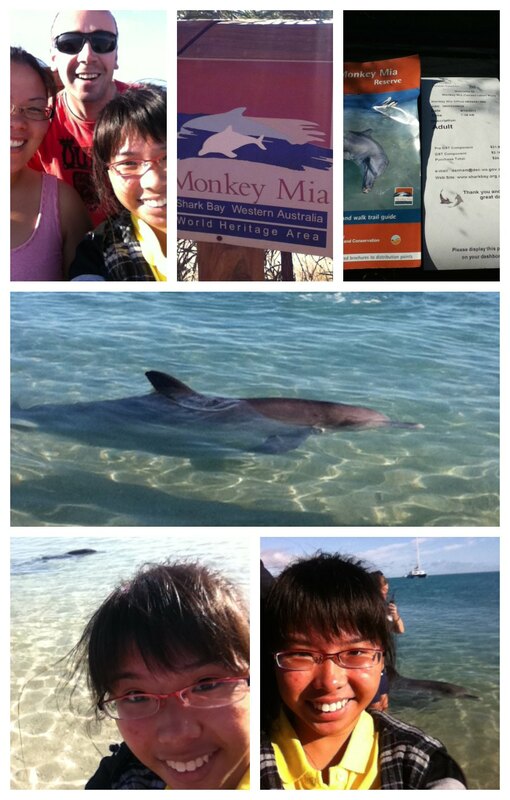 As an avid dolphin lover, my Auntie Fiona and Uncle Jaap made a detour to Monkey Mia so I could enjoy dolphin watching. I love watching the wild dolphins because they are not restrain to swim only at a big pool but they can go anywhere as and when they like and only come to Monkey Mia for food. I felt so happy for the “Free Dolphins”. Freedom is priceless! 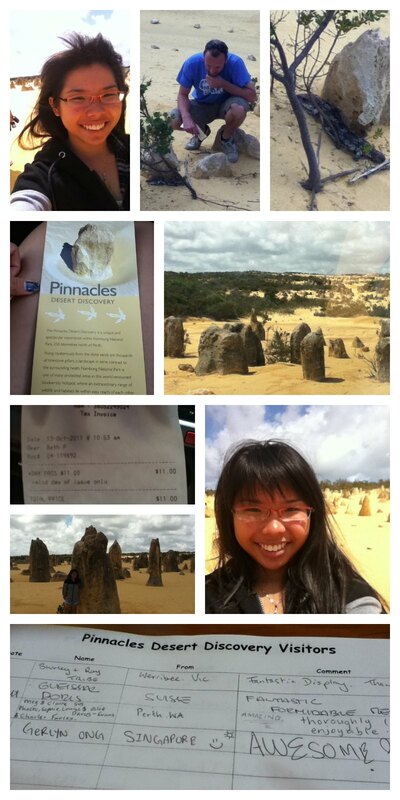 This pinnacles is abit like the Taiwan YELIU, aka the Queen Head Rock but this is the Aussie version. For the desert lovers, this is definitely a must go place for you! I find it pretty interesting because of the snakes and lizards I saw. It quite awesome to see that how strong their survival skill is to stay alive in harsh condition! 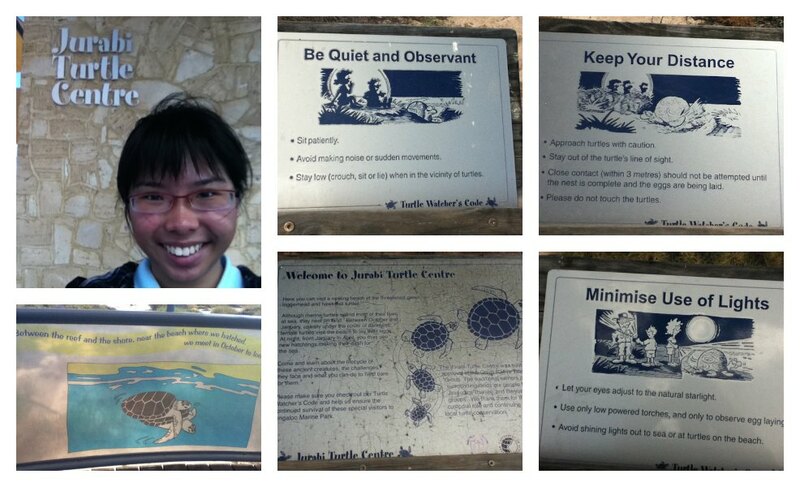 Visit this place at night because the turtle only lay eggs at night! I saw the turtle at about 2 midnight and I accidentally made some sounds as I was too excited and the turtle crawl back to the sea. Thus it is a regret that I did not get to see them lay eggs. So remember, NO NOISE , NO LIGHTS, NO CLOSE UP! Many of you would ask, Why you love this trip so much? I like the freedom of free & easy trip like this. We drove our own camper-van, we can stop whenever we like. We can snorkel and any beaches, anytime with no restriction. Travelling should shows no boundary and letting you explore life and experiencing new things. I love travelling a lot and most of you THOUGHT that I am pretty well-to-do but I am just an average girl earning an average paycheque. I do not earn much but I am willing to spend on travelling. I want to see more and explore more in my life rather than reading NATGeo about the different culture and lifestyles other is experiencing. I highly encourage all of my readers to travel once a year. Carry a Camera, your passport, and just let it go and have fun. Travelling should start early, but it is never too late to start travelling. We all paid $60 for this red passport and shouldn’t we make full use of it and have it filled with different countries stamps/chops? Let’s all aim to do this together! Share with me where you think I should explore next too!